Millions of David Bowie fans were shocked and saddened to learn this morning that the influential rock star had died of cancer yesterday (Jan. 10), a few days after his 69th birthday. Throughout his career, Bowie’s influence on music, fashion, technology and culture was felt across the world—and even in outer space. One of the best tributes to Bowie (and appropriate, given his stratospheric reach) is Canadian astronaut Chris Hadfield’s stirring rendition of the singer’s 1969 single “Space Oddity, ” recorded on board the International Space Station (ISS) in 2013. 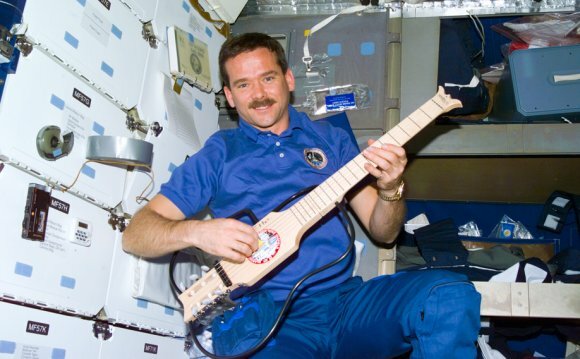 Hadfield’s video of the performance made history as the first musical recording in space and has been viewed on YouTube almost 28 million times. Bowie himself called Hadfield’s cover “possibly the most poignant version of the song ever created” when he shared the video on Facebook. The video features views of Earth from space and is spliced with shots of Hadfield singing and playing the guitar. The cover was briefly taken down in 2014 due to licensing issues, which he discussed in a post on his website. Bowie and Hadfield originally agreed to a one-year deal for the music rights, and then a 2-year agreement, when the video was re-uploaded in November 2014. The cover led to discussions about copyright law for music recorded in outer space—which The Economist analyzed in depth.